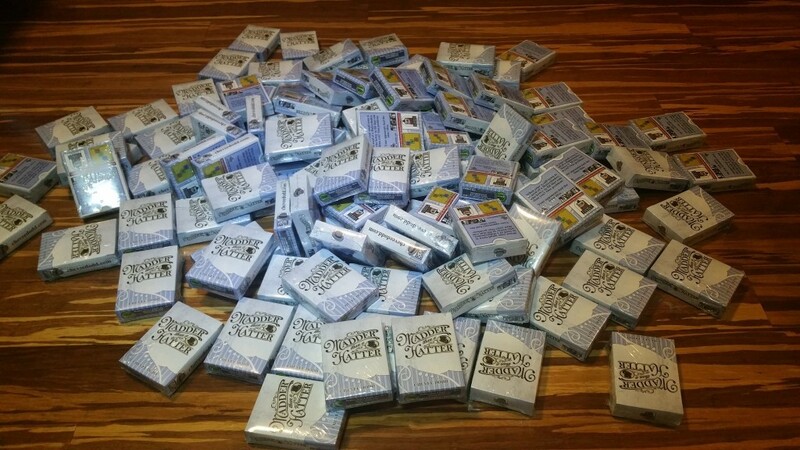 Last year, I had a crazy idea: print a bunch of copies of a game, then give them away for free. Everyone I talked to was excited about the idea, but completely confused by the reasoning. Yes, as a game designer and sometimes-publisher, it doesn’t make much sense for me to just give stuff away. There’s not a sustainable business model in giving away products for free. That’s all true… but I don’t care. I’m doing it again. 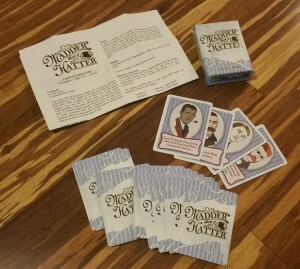 Madder Than a Hatter is a hybrid of take-that and set collection mechanisms. On your turn, you must place one hat into any player’s inventory and take the first hat off of the hat maker’s assembly line. Some hats are premium and allow you to manipulate the player’s inventories or the hatters assembly line. After all hats have been played, points are scored and a new round begins. Points are scored for having only one hat of a style, or for having a monopoly on a style. Play a number of rounds equal to the number of players, then whoever has the most points wins! That’s what it says on the boardgamegeek.com page. This is the basic story of how the game plays, but not how the game came to be. If you haven’t been following along, this game was specifically born for this year’s giveaway and I logged the entire adventure of designing it on video. You can catch up with the series here on my blog or on my YouTube channel. This year, I coordinated with some awesome sponsors to help bring as many copies as I possibly could to Gen Con. With the help of these fine ccompanies, I’ve managed to print over 100 copies of the game! Without them, I would have likely had significantly less. So, if you see them on the street… or even on the internet… please say thanks to them for me. Here’s how this works: by Gen Con rules, I am not allowed to solicit. I’m not allowed to hand these out unless I have a booth. So, just like last year, you MUST ASK ME for the game. That’s right, find me in Indianapolis and ask. I’ll only have about 50 on me each day of the show (Thursday thru Sunday) so if I run out, you’ll have to find me the next day. Just like last year, I will post a full set of rules and a “how to find me” page each day of the show, so be sure to sign up for my newsletter (over there –>) to be clued in on how to get your very own copy, and let’s have fun together at Gen Con! See you there!